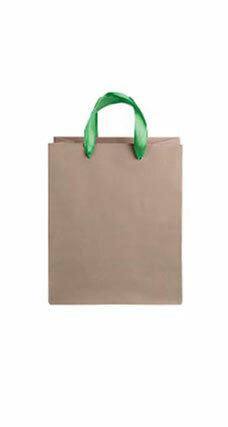 Medium Kraft Premium Folded Top Paper Bags with Kelly Green Ribbon Handles are great for your business! These strong paper shopping bags give your customers a convenient way to carry medium sized purchases like gifts, trinkets, and other small items. Each bag features Kelly green ribbon handles, a gusseted bottom, and tear resistant Kraft paper, allowing customers to carry multiple objects in one bag.